251 W 100th St, New York, NY 10025 at the corner of West End. 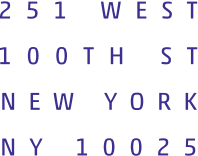 Parking garages are located on 100th Street, between Amsterdam and Columbus Avenues, and on 97th Street, between Broadway and West End Avenue. If you wish to park on the street, leave at least 30 minutes to find a spot.